Listen to a great interview about Waikiki Aquarium's history, staff, causes and much more. To inspire and promote understanding, appreciation and conservation of Pacific marine life. Founded in 1904, the Waikiki Aquarium is the second oldest public aquarium in the United States. A part of the University of Hawai`i at Manoa since 1919, it is located next to a living reef on the Waikiki shoreline. 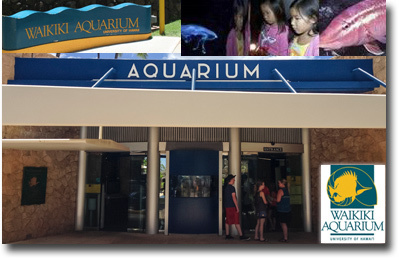 Exhibits, programs, and research focus on the aquatic life of Hawai`i and the tropical Pacific, with roughly 320,000 people visiting the Aquarium each year. Over 3,500 organisms are on exhibit representing more than 500 species of aquatic animals and plants. Self-tour opportunities for individuals and groups: interpretive graphics & exhibits, handouts are available. 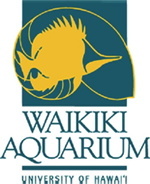 Membership: Join the Friends of the Waikïkï Aquarium (FOWA) to enjoy the annual benefits of free admission, 20% discount at the Natural Selections gift shop, quarterly mailings of our beautiful and informative magazine Kilo i'a, free salt water pick-up, and facility rental privileges at "Family" and "Family Plus" levels. To select the membership level right for you,please see the Visitor Services staff or contact Events and Membership Manager Raina Fujitani at (808) 440-9008 for more information. 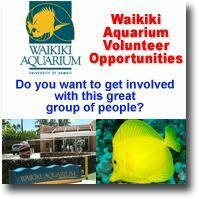 Volunteerism: When you donate your time and curiosity to the Waikiki Aquarium, you are rewarded with diverse and challenging opportunities to help make a difference! Education-- Docents provide on-site presentations and tours to elementary school groups and provide outreach programs for school and community groups. Interpreters at the Edge of the Reef exhibit assist visitors and provide up-close observations of Hawaiian marine life. Live Exhibits -- Assist with husbandry, tank maintenance and feeding. Natural Selection Shop -- Assist with stocking inventory and sales. Membership/PublicRelations/Special Events - Assist with bulk mail outs & communications with Aquarium members, public relations surveys, record-keeping and special events. 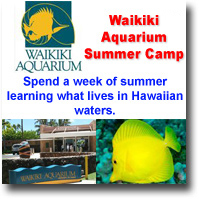 Spend a week of summer learning what lives in Hawaiian waters. The Waikiki Aquarium aims to "inspire and promote understanding, appreciation and conservation of Pacific marine life." Many wonderful people help to make this mission a reality.